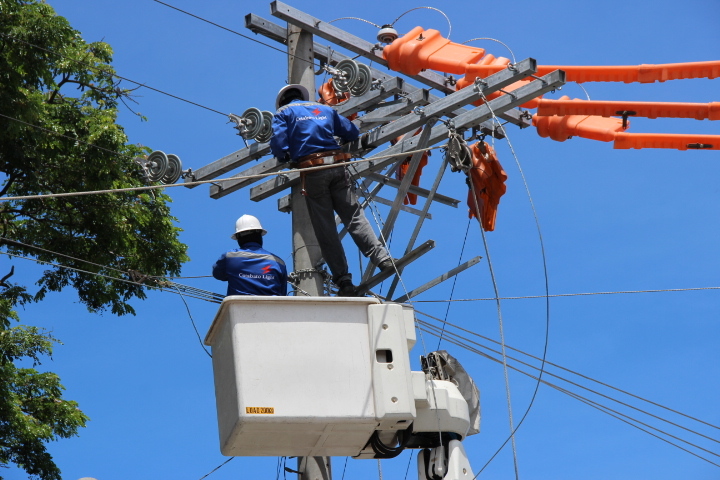 Cotabato Light Linemen Jeffery Escalona and Adellene Merciadez during the line upgrading. The project was started by series of pole erection, pole dressing, and a survey in order to attain the standard distance where linemen aims to maintain, whenever possible line fault occurs. The area covers from Tamontaka bridge going to crossing Awang, Datu Odin Sinsuat which started this January. The line stringing and upgrading continued last March 26, 2014. A total of 44 primary line pole structure was upgraded. The said activity was done during the scheduled maintenance on power and transmission lines. This is necessary to maintain reliable and quality electric service and for the safety of the public. The project cannot be done while lines are live and energized. Transmission and Distribution (T&D) Supervisor Mr. Bernabe C. Parcasio who is taking the lead, with the assistance of sister company Davao Light for the equipments used, and coupled with the strong teamwork and cooperation of the T&D linemen along with Indong Contractors, the project is said to be accomplished by April 2014.